One of the few historic homes that have remained in the same family for the majority of its lifespan, the house is considered one of the best designed in Charleston's National Historic Landmark District, and has generated plenty of admiration from passer-bys and regular visitors alike. The grand home was first envisioned by an up-and-coming local merchant, John Robinson, who built the home in 1820 as a typical "Charleston double house" with a central hallway, and two suites of rooms located on either side. Robinson's luck turned shortly after construction was complete, however, and after losing five ships at sea, he was forced to sell the house in 1827 to another Charleston local, William Aiken, Sr.
Aiken was an Irish immigrant who had become a very successful local merchant, but he would also prove to be another unlucky homeowner, and after dying in a carriage accident, the house would be passed on to his wife, Henrietta Wyatt Aiken and his son, William Aiken Jr. In 1833, William Jr. decided to make the home his primary residence, and along with his wife Harriet, began planning an extensive renovation which involved moving the front entrance, reconfiguring the first floor altogether, and adding a large addition to the house. 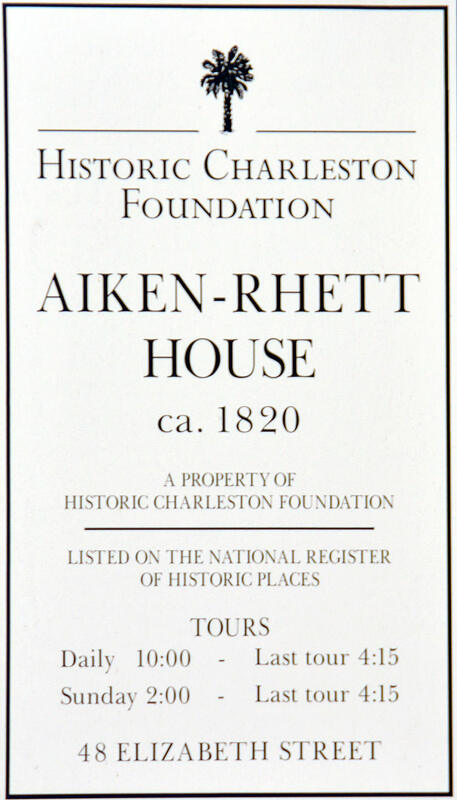 By the end, locals and visitors agreed that the "new" William Aiken House was one of the most impressive structures in Charleston. William Jr. did quite well for himself, to say the least. He was one of the state's wealthiest citizens, as well as a successful businessman, rice planter, distinguished politician and later the governor of South Carolina. Their home grew in splendor as William and his wife travelled abroad and collected fine art and furnishings - with many pieces later donated to a new art gallery that William commissioned himself. 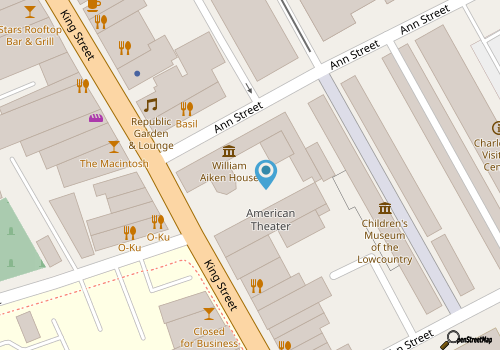 When William Aiken, Jr. passed away in 1877, followed a few years later by his wife in 1892, the home was passed on to their daughter and her husband, Major A.B. Rhett, who together raised four sons in the fine Charleston home. Subsequent generations would continue to live at the house until it was sold to the The Charleston Museum and officially opened to the public, for the first time, as a museum house in 1975. The Historic Charleston Foundation purchased the house from The Charleston Museum in 1995, and took over the reins, working to preserve the home and its treasures, while still keeping it wide open to the public. Today, the home is open daily for tours, and visitors are always wowed by the impressive grandeur both inside and out. The massive porches lined with slim white columns stand out against the mustard yellow exterior, while a brick and iron border is lined with seasonal blooms and flowering climbing vines. Inside, the home is just as impressive, although slightly eerie, as although the exterior fits in perfectly with the impressively pristine downtown buildings, unlike other historical homes, the inside has not been restored. Slave quarters and stables are located out back in a large but simple two story building, and while the garden can be a delight with well-tended blooms, the home itself looks like it has been all but abandoned. For many visitors, however, this gives the home an air of authenticity, as paintings and family furniture are perfectly arranged as if they had never been touched since the Aiken-Rhetts left their family home after 142 years.In essence , the home has been "preserved," and not "restored," which means that the majority of small personal touches from the peeling paint to portraits on the wall are more or less genuinely the Aiken-Rhetts' own. Narrated tours are available Monday through Saturday from 10:00 a.m. until 5:00 p.m., and on Sundays from 2:00 p.m. until 5:00 p.m., with the last tour beginning at 4:15 p.m. Tickets generally run around $10 for adults and $5 for children, and can be purchased on site. The home also features the only historical "audio tour" in Charleston, ensuring that visitors can soak in as much information as possible, at their leisure, about the priceless artifacts and the Aiken family story. Group tours or special educational programs can also be arranged in advance by calling the Historic Charleston Foundation directly at 843-723-1623. The Governor William Aiken House, or Aiken-Rhett house, stands tall as one of the most massively impressive residences in Charleston - a difficult feat considering the blocks upon blocks of outstanding ancient homes. And while the inside may not be as perfectly grand as the outside, the authentic airy rooms that have been carefully preserved, just not restored, are easily some of the most spellbinding for history buffs. 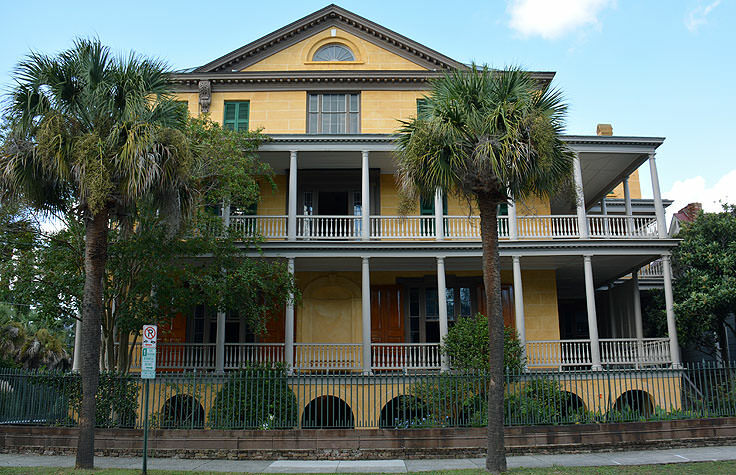 A true look into everyday life of Charleston's wealthiest elite, the Governor William Aiken House is a must for anyone who loves history, architecture, and genuine but untouched antebellum beauty.